Remember Jim Darlack's CCC honorable mention custom centaur Abusson, you may have wondered how it was made. Well, he's written up a How-to article on this and other custom centaur techniques. I have to apologize to Jim - it was actually written up a while ago and I forgot to post the link. Great article, although I don't plan on splitting open a house soon. Nice tutorial! Maybe someday I'll have enough horses to do this. I need cavalry though. Yes, thats a really nice tutorial! Forestboy wrote: I don't plan on splitting open a house soon. I really hope so. But if you should decide to split one open, please dont take the one i live in . Forestboy wrote: Great article, although I don't plan on splitting open a house soon. 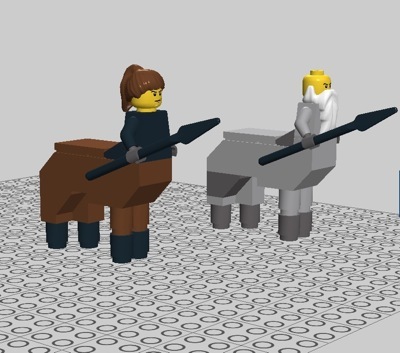 I build centaurs like this - http://www.boardgamegeek.com/image/579956/brick-battles. It give me the opportunity to have centaurs without losing any of my horses. Albatross_Viking wrote: Yes, thats a really nice tutorial! *Smacks forehead* Oh, sorry! I meant HORSE not HOUSE . Oh the joys of miss typing something..
On topic: this article is great, I like how he's compiled a list of other techniques, not just his own. I really like the look of these in the tutorial. This would be my alternative idea, though, based on the "old-school" brick horses from the yellow castle. Disadvatage: blocky looking. Advantage: A six-year old kid could build them without tearing up his other toys. I did this once, and instead of taking the horse apart, I just cut off the head, sanded it down, and glued some studs on the top. It worked okay, but I haven't taken any pics yet. If you would prefer not to mutilate your horses, but want something more than a brickbuilt centaur, check this out. Check out the blog post / flickr link for pics of more brickforge prototypes! jdarlack wrote: If you would prefer not to mutilate your horses, but want something more than a brickbuilt centaur, check this out. Great article! But wow! That BrickForge prototype looks awful promising. I'll have to get a good amount of those one they're out! That centaur body looks awesome, as do the other items in the picture. Brickforge keeps making interesting parts, apart from the usual weaponry!